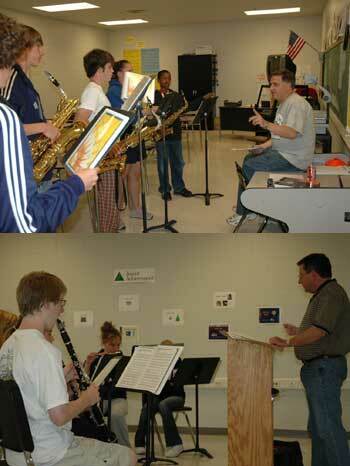 The sounds of reed instruments filled the hallways at the recent rehearsal camp of Memphis Sound. Freshmen and sophomore members of the Arlington High School Band rehearse with Memphis Sound. No, the corps is not trying to rewrite the rules of DCI competition. Instead, as part of the corps community outreach mission, the staff of Memphis Sound entertained and instructed next year's freshmen and sophomore members of the Arlington High School Band in Arlington, Tenn. The school served as the host site for the corps camp held from April 29-May 1. While the 100 members of Memphis Sound were in music sectionals, the corps' visual staff conducted a body stretch and fundamentals block for the band students. Then when the corps members moved to visual rehearsal, the brass, percussion, and guard staff took over and conducted rehearsal for the students. "It's a great way to share resources," says Arlington's band director, Richard McAnulty. During the day on Saturday, woodwind and brass students were able to play through their fall show music and, with the help of Memphis Sound's percussion staff, the band's drummers were auditioned and placed on parts. Memphis Sound thanks its staff for being so flexible and willing to share their talents with young students. The corps also thanks Dr. Jeff Cozzens, principal of Arlington High School, for being such a great host.